​In September of 2007, she began the first of two seasons as a fellow the New World Symphony. While there, she had the opportunity to work with one of the premier conductors of our time, Michael Tilson Thomas. Nicole won her first professional position as the Second Trombonist of the Alabama Symphony for the 2009-2012 seasons. In September of 2012 she joined the Colorado Symphony as the acting Principal trombonist for the 2012-2013 season. In the same year, she also filled in as acting Principal Trombone in the Macon Symphony under the direction of Ward Stare. Nicole has also had the pleasure of performing with the Atlanta Symphony Orchestra, National Symphony Orchestra, St. Louis Symphony, Qatar Philharmonic Orchestra, and Huntsville Symphony Orchestra. ​Colin is a Shires Sponsored Artist. Nicole Abissi is a professional trombonist and teacher living in New York City. She is a member of the nationally touring Stiletto Brass Quintet and performs on Broadway and with professional orchestras around the world. As a student of Doug Wright, David Finlayson, and Joseph Alessi, Colin is a product of excellence in trombone pedagogy. 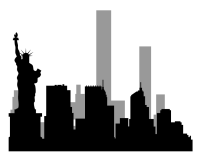 His extensive orchestral career also makes him an expert in orchestral playing. While a member of the Atlanta Symphony, Colin taught many exceptional students through the Talent Development Program, as well as in his private studio. His students have gone on to such schools as The Juilliard School, The Curtis Institute, Northwestern University, and New England Conservatory. Colin is also a founder of The Southeast Trombone Symposium; a weeklong intensive workshop for high school through college age players. 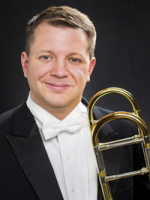 In addition to his busy schedule with the New York Philharmonic, Colin is currently a trombone professor at Montclair State University, Rutgers University, and Manhattan School of Music. Lessons with Colin need to be scheduled as far in advance as possible, due to his full calendar. Nicole is very passionate about teaching. 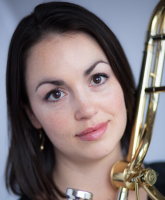 She has had the good fortune to study with many of the best performers and teachers of all brass instruments around the world and loves to pass on this information to others. She also believes that playing music and studying an instrument privately can help people of all ages become a more effective person in the rest of their life. She works with students on time management, problem solving, non-linear thinking, creative story telling and expression. In addition to all of the more technical work that she does with students on how to play the trombone and understand music, she wants to make it fun, exciting, and challenging. We use the word "play" for a reason when talking about instruments and she intends for it to feel like playing when working together. That said, if someone is looking for a more intensive environment, she can also deliver that. In fact, she has several students currently studying trombone performance in college at this time. Nicole's former students attend such schools as The Juilliard School, New England Conservatory, Northwestern University, and Lynn University. Whether you are looking to play your band music better, get into the all state band, or simply pick up an old hobby from high school, Nicole can be the kind of teacher you are looking for. We want to help you achieve your potential. When you have decided which teacher is right for you, send us an email so we can schedule a time to work together.